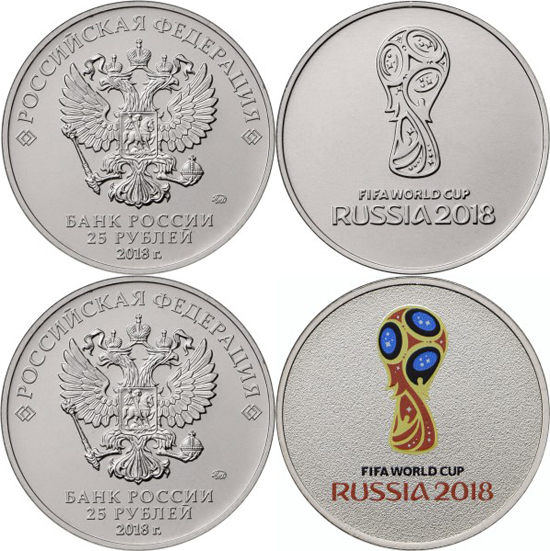 Government Mints issue Commemorative coins to commemorate some particular occasion or special event, like the FIFA World Cup. 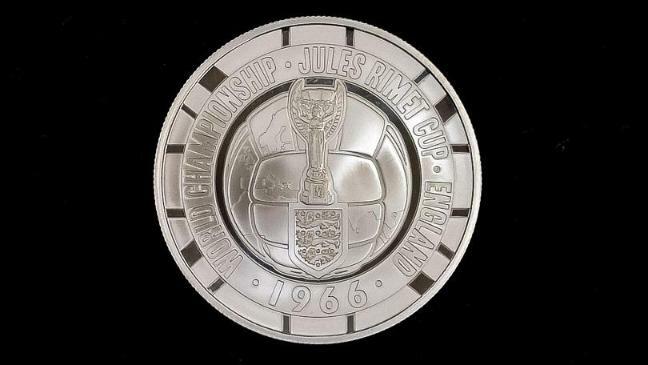 Commemorative coins do pre-date the 1960s, but became a more regular feature after this time. 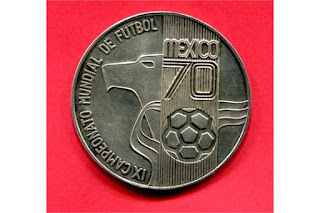 These coins have distinct designs with reference to the occasion for which they were issued. Some coins serve only as collectors’ items, but many mints issue commemorative base metal coins for regular circulation. 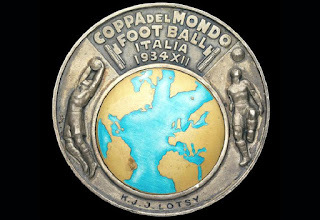 Prior to World War II, commemorative coins were always made of precious metals. Gradually, the use of precious metal coins became increasingly restricted, and almost abandoned about 1970. Coins made from precious metals ceased to be circulating currency, used in everyday transactions. 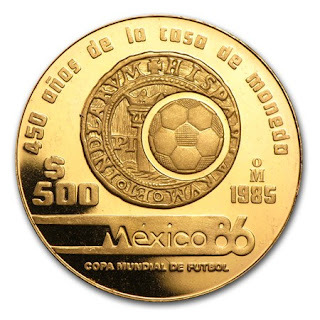 The increase in coin collectors world wide created a demand for commemorative coins. 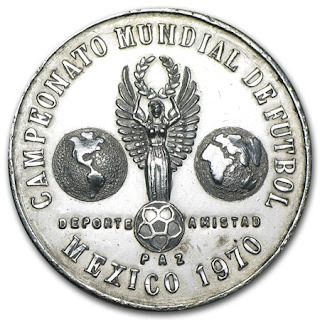 Hence forth, the coins were divided into two types; those made from base metal and issued as everyday currency, Circulating commemoratives are intended to be used for commerce, but the design will only be issued for a limited time, is intended to draw some attention to a specific event or person ; and non-circulating medal-like coins made from precious metal for collectors only. 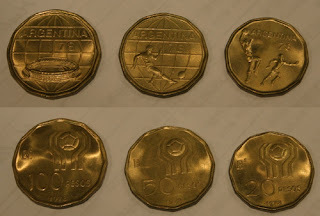 Non-circulating legal tender (NCLT) are coins which are legal tender, and can in theory be used to purchase goods or services, but are not intended to be used in such a manner. Rather, they are intended to be used only as souvenirs, and are often produced in gold or silver with a proof finish. Circulating and non-circulating commemoratives are usually issued jointly and the events these coins commemorate, such as the World Cup, are chosen based on a perceived market, rather than events of significance to the country. 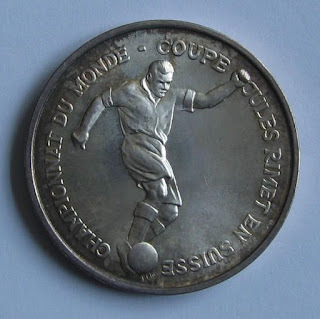 Almost every nation has issued commemorative coins, but those countries with smaller domestic populations direct their non-circulating commemoratives towards the international market. 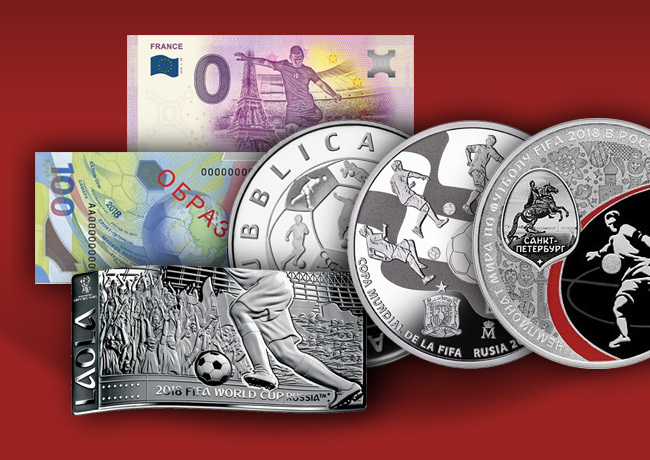 Governments anticipate commemorative issues such as coins, bank notes and postage stamps, encourage local people to collect them as keepsakes, thereby taking them out of circulation. 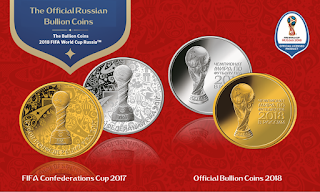 The cost of producing these is a fraction of their face value, and when taken from circulation, this constitutes a profit to the government. 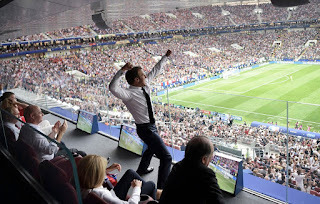 This is called seigniorage, and can generate millions to a national treasury. Numismatics describes the systematic study of currency and includes the collection of currency, including coins, tokens, paper money, and related objects. 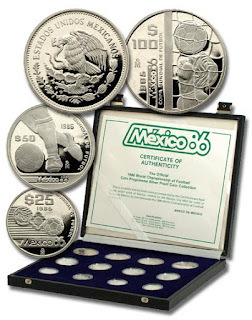 Coin collectors, on the other hand keep coins or other forms of minted legal tender. 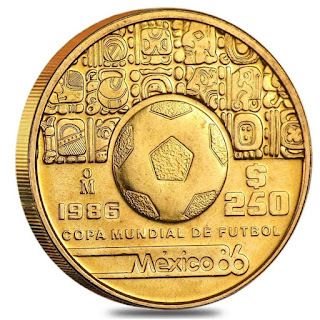 To the serious collector, the grade of the coin is a main determinant of its value, but most collectors are hobbyists, and amass a collection purely for the pleasure of it with no real expectation of profit. Since the beginning both medals and coins have become popular souvenirs of the FIFA World Cup TM. 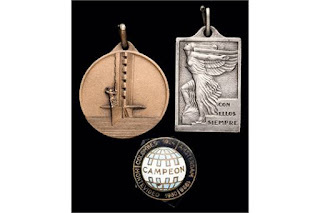 At first commemorative medals were struck and avidly collected by enthusiasts. 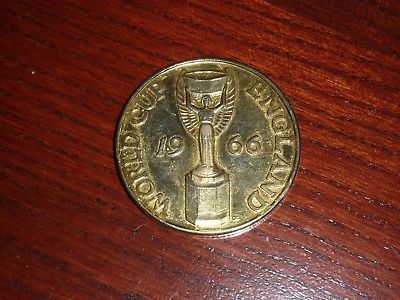 The 1966 FIFA World Cup TM, was hosted by England. 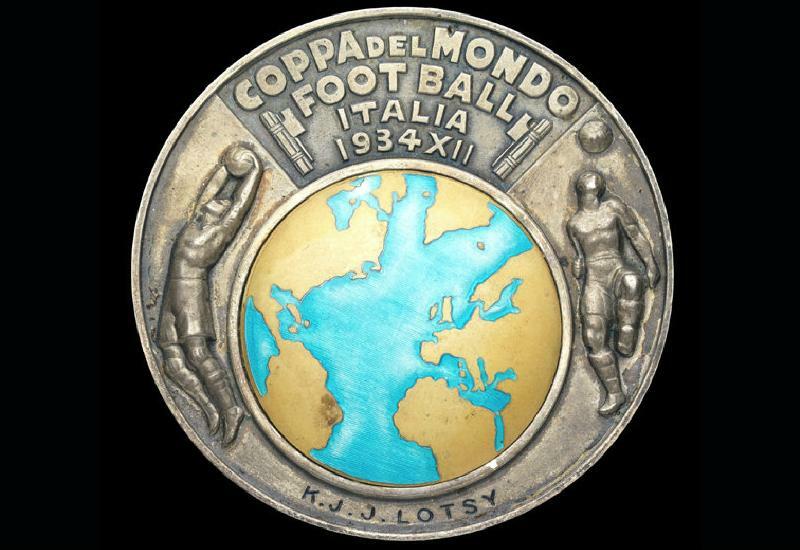 The National team went on to win the final and all manner of memorabilia from this period became highly collectable. 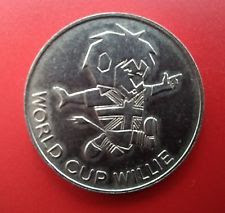 The mascot was World Cup Willie and a medal keepsake was struck featuring the cartoon character. Other more rare commemorative medals were struck for collectors. 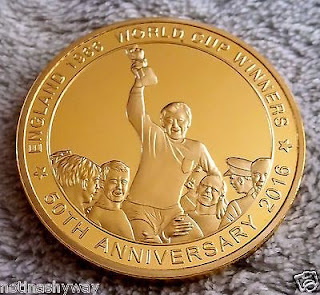 In 2016, the Royal Mint marked the 50th Anniversary of England’s victory at the 1966 FIFA World Cup TM, with a limited issue of a set of coins which feature the original design by Royal Mint coin designer Emma Noble, who was inspired by England’s 1966 FIFA World Cup™ logo. The set includes Brilliant Uncirculated, Silver Proof and Gold Proof coins. 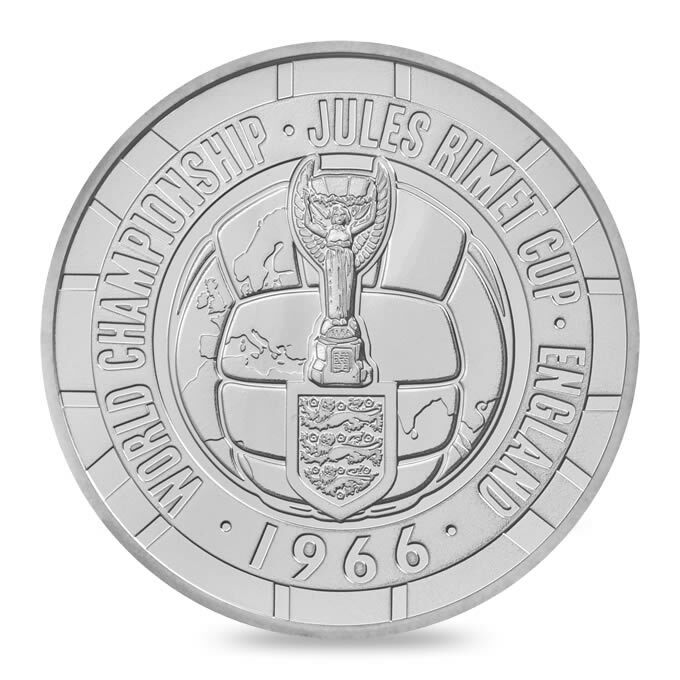 A donation from each of the official 1966 World Cup coins purchased will be made to The Bobby Moore Fund. 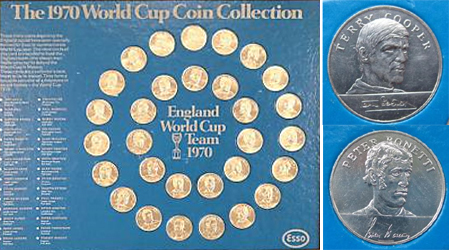 By 1970, many smaller promotions sprang up, including the Esso World Cup Coin Collection. 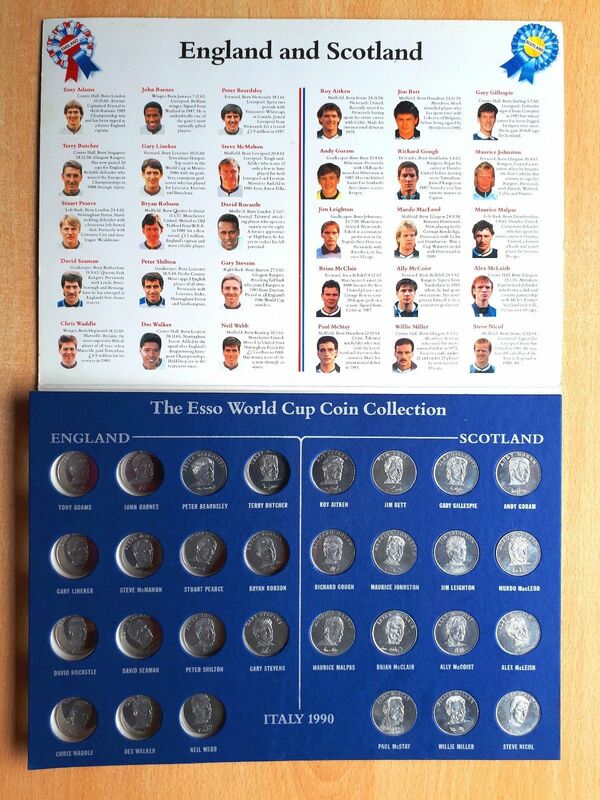 Esso (now part of the Exxon Mobil group) commissioned 30 coins depicting the England squad for the FIFA World Cup TM. The coins were made of solid metal alloy and wrapped for distribution through petrol stations. The coins were given away with every gallons of petrol purchased. Cleverly the sealed pouches meant the coins were offered unseen making it necessary to swap duplicates if the collection was to be completed. 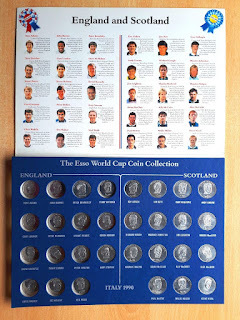 Esso supplied a free red card with 30 slots to hold the coins. A blue mounting board made of thick carboard could be bought from Esso petrol stations for 2/6. 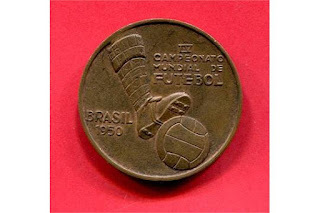 The board had pre-cut holes to mount the coins. 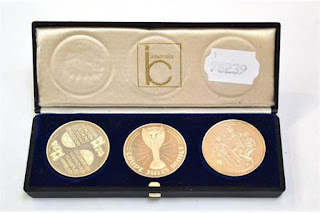 A very rare, set of coins was made of solid bronze by the Franklin Mint for presentation by the Esso Petroleum Company Ltd. Sir Alf Ramsey was presented with a Sterling Silver set by Franklin Mint. In 1990, Esso reprised their coin collection to celebrate the Home team qualification of both Scotland and England to the World Cup finals in Italy. 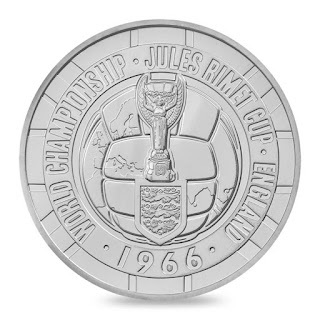 Other countries including, Ras al-Khaimah, an emirate of the United Arab Emirates issued circulating commemoratives coins fr the 1970 FIFA World Cup TM. 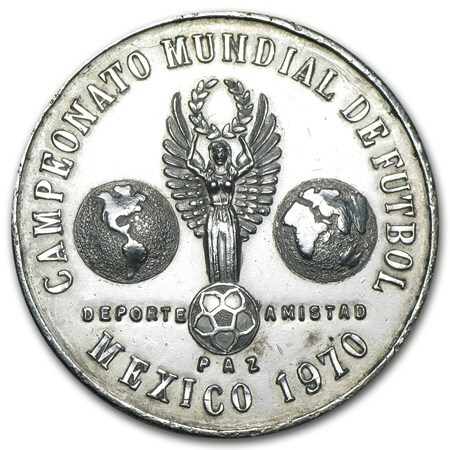 More commemorative coins were issued for the 1974 FIFA World Cup TM Germany. 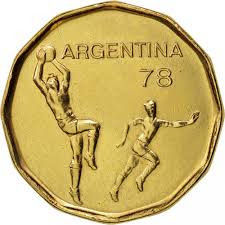 These coins are from Argentina to commemorate 1978 World Cup TM Argentina. 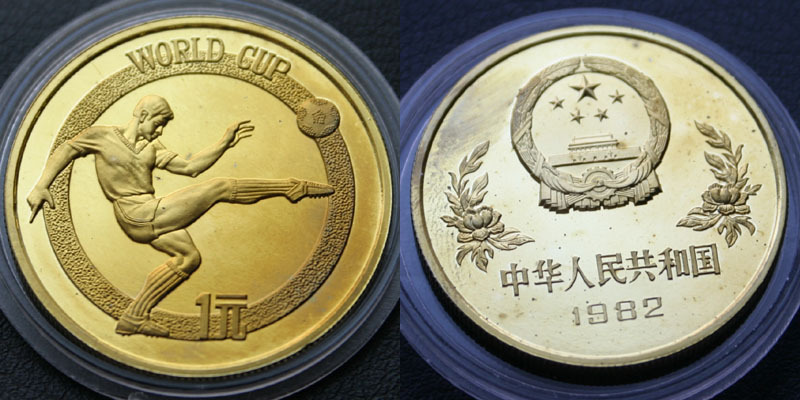 The People's Republic of China issued un-circulated commemorative coins which were sold abroad, not in China. The set struck at the Shanghai Mint , included one gold, one copper, and two silver coins. 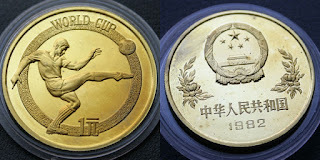 The theme was commemorated as a modern Chinese coin series despite the fact that China failed to qualify for the group stages. The 1982 12th FIFA World Cup ¼ oz gold coin bears a glaring error in the inscription on the reverse face. The incorrect character is the final one of the reverse inscription, and should be 赛 sai4, meaning competition. 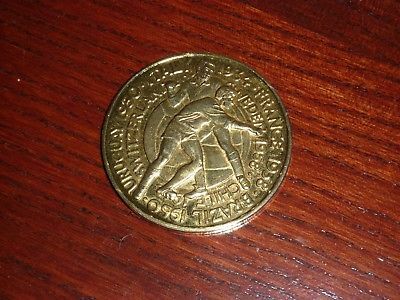 Only 1261 gold coins were minted, making them highly collectable . 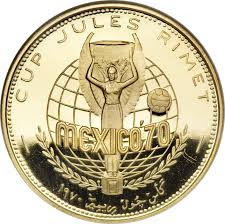 The coins were designed by two female contributors: Zhong Youqin designer of the gold, silver and copper coins of the 1980 Winter Olympics and 1980 China Olympic Committee series; and Chen Yanyin artist and leading female in the world of oil painting and sculpture in the PRC. 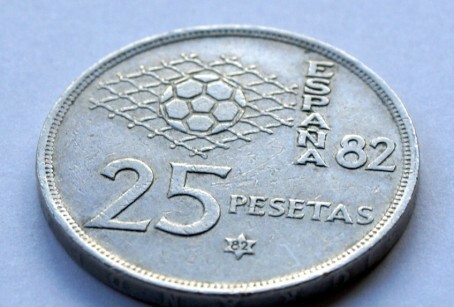 Both Spain and Ethiopia issued commemorative coins for regular circulation. 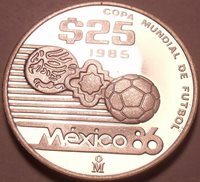 The celebrate the 1986 FIFA Wolrd Cup TM Mexico Non-circulating commemorative coins were struck including a gold 1986 Mexico 250 Peso 1/4 oz Proof Gold World Cup Coin. 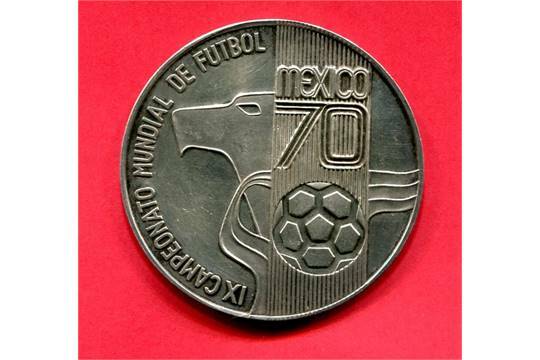 Mexico also issued commemorative base metal coins for regular circulation.